With different privacy levels, you can control who in your team has access to a contact and their related work items. Karbon is designed to provide complete visibility across your team, which extends to email, internal communication, contact details, work items and tasks. From time to time however, you may not wish to share some communication, or an entire contact and their work details with you entire team. Karbon provides a number of privacy settings that allow you to control the level of visibility provided across your team. Only the client team will have access to that private contact and their work. Colleagues who don’t have access will see the client and work names, but will not be able to view details or any communication that occurs. Assign the colleague a task within a work item. Assign the colleague a note that is linked to the work item. @mention a colleague in a note that is linked to the work item. Add a colleague to the associated client team. Reassign the work item to the colleague. Assign the colleague an email that is linked to the work item. Keep in mind that when you assign a colleague to anything related to the work item, and not the contact, they will only have access to that work item. Those individuals as well as the entire client team will have access to any tasks, notes and emails that flow through that contact’s work. If you would not like to share a specific note or email with a private client you will need to go into your Triage > Info tray > Briefcase icon > deselect those associated with that email you’d like to keep private. To toggle between these privacy settings, go into the details tab of a contact or organization, select edit and choose your level of privacy. By default emails are unshared, they can however be shared with a contact’s timeline or a work item. You can link an email to Work directly from an email by clicking "Add to work" within the email, the Work icon on the action bar or the email's options menu "...", selecting "Add to work" or "Create work"
To remove an email you can remove it by clicking ‘X’ from the email’s timeline tray. 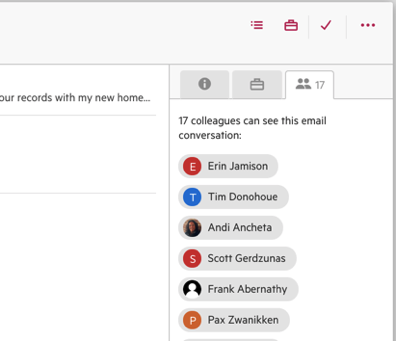 An email is visible to any participants in an email conversation (including BCC and CCC recipients), colleagues added through email comments, or those with access to a work or contact timeline the email has been added to.